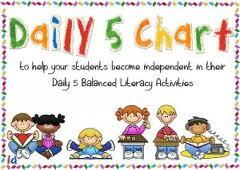 We will be doing the Daily 5 in our classroom this year. We will have three 20 minute sessions where students will be working on these five areas. We do not do it exactly like the book. I require every student to do Read to Self and Work on Writing everyday. For the third session they may choose between the other three options. They are required to rotate between the other options throughout the week. Between the three daily sessions, we will meet together on the carpet to “check-in” and talk about how the session went. While students are working on the Daily 5, I will be meeting with reading groups. Just like reading the best way to become a better writer is to write each day. It’s Fun! Partner reading provides opportunities to practice strategies, improve fluency, check for understanding, and hear your own voice while sharing in the learning community. and the ability to get your ideas down on paper. Just hearing fluent and expressive reading of good literature expands your vocabulary, helps build your stamina and will make you a better reader.